I didn't want to babysit a grill this evening, so I fired up the Cobb outdoor cooker. 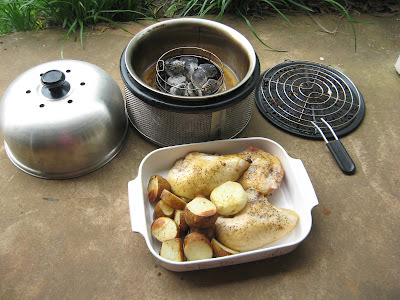 It's a neat little enclosed cooker that cooks a chicken and potatoes with 8 to 10 pieces of charcoal (and is still hot enough to do more food). I would consider the Cobb grill ideal for campers and tailgaters, but it's also fun at home. 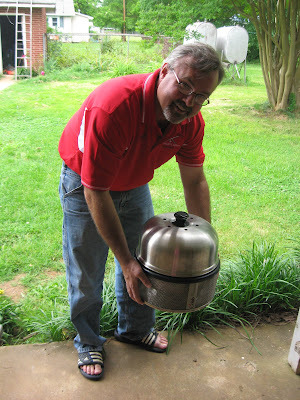 If you want to read more about the Cobb, I wrote up a Cobb review at Yes You Can Grill. That covers more details for readers who may be interested in this unique outdoor cooking machine. We had a little rain this afternoon, but that was no big deal. The Cobb stays cool to the touch on the bottom. Lid does get a bit hot. But, it's easy to move the cooker up under the porch if needed. It can also sit on a table even with a tablecloth, so that's a bonus. It would be safer than most grills around kids, but do tell them not to touch the top. Well, don't touch any part. But, the Cobb is insulated so that even though it burns charcoal, it's not blazing hot like most units. Here's right after I wrapped up the Cobb meal. You can see the various parts. There's the housing, grill top (with lifter), a metal grate above (accessory add on), and the lid. Very compact. The chicken was absolutely fabulous. Really moist and juicy. Potatoes came out a bit dry. They are better on the top, but I'll play around with cooking them in the moat in the bottom. That's pretty neat, and I figure I just need to practice and try some other ideas. Generally, I just add some beer there in the channel or moat to add some moisture to the food cooked above. That's works really nice. Wow! I am not familiar with the Cobb BBQ. Looks like a great little thing to take on picnic outings. Thanks a million for commenting on my blog. I appreciate it very much. In the meanwhile you keep up the great work. Gave you a plug on my blog...you deserve it! Thanks Thom. 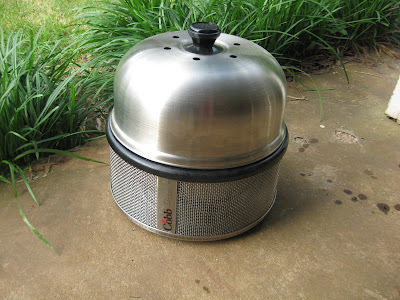 The Cobb is a really handy little outdoor cooker. I should get the topper griddle to make bacon and eggs. That would be super for camping. Tks for mentioning me on your blog.